Company PT trgovina in storitve d.o.o. is known for many years for having a reliable and affordable transportation services. They are known for the best taxi transfers that Kranjska Gora has to offer. PT d.o.o. 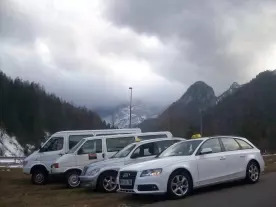 offers taxi services, airport and railway stations transfers and also has a ATV (quad) rent, rent a car in Kranjska Gora and bike rental shop in their offer. They provide taxi services from door to door, airport transfers from and to Kranjska Gora and day trips in the surroundings of Kranjska Gora. Of course they gladly go much further for their customers, so you will be able to visit Austria, Italy, Croatia and other parts of Slovenia. Their taxi company is always up to date with their taxi services. All their drivers are local people with a lot of experiences in tourism and they all speak English, German and Italian. Their goal is to be flexible and to provide safe transfers from one place to another by having all licenses required for transportation business. Besides rent a car services, you also have an option to transport your bicycles and motorbikes. Kranjska Gora is the most beautiful destination in Slovenia and it's ideal for summer recreation and snow sports like skiing or sledging. Don't hesitate to ask them for any kind of a advice about trips you want to take. For the best taxi Kranjska Gora and more information about taxi services, airport transfers, rent a car, transportation, trips or sightseeing, contact their taxi company! PT taxi is available 24/7 just for you.